How big have fandom cons become? 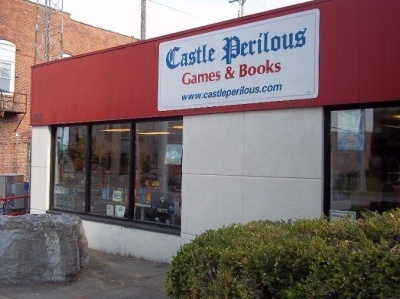 New data confirms explosive revenue growth. You might have heard that geek culture conventions these days are kind of a big deal, and big crowds suggest big money. Every show gives us a new opportunity to ooh and ahh over gate-busting attendance records and the seemingly insatiable appetite for panels, cosplay and swag that has escaped from geek subcultures into the general population. But getting a top-down view of the overall fandom event market is harder than sneaking into Hall H on Saturday afternoon. The plural of anecdotes. New data from the online ticketing platform Eventbrite, which has been closely studying the fandom event space, confirms the tactical and anecdotal observations made here and elsewhere, and provides some wider context for the scale of growth. As reported earlier, Eventbrite’s estimate for total ticket sale revenue for the fandoms industry in 2013 ranged from $524 million (assuming their study identified 90% of all fandom conventions in the US) to $644 million (assuming 70%). That’s nearly double the previous market sizing estimate. But it gets more interesting when you dive into the details. Broad-based study. Last year, Eventbrite conducted a research study of 962 unique fandom events across multiple categories in the United States, based on publicly available attendance figures, pricing and social media data. Eventbrite’s definition of the fandom market segment includes comics, sci-fi, gaming, anime, and specialty fandom events (horror, steampunk, furry, multi-genre and collector, among others), identified according to the pie chart below. Attendance is growing by double digits. 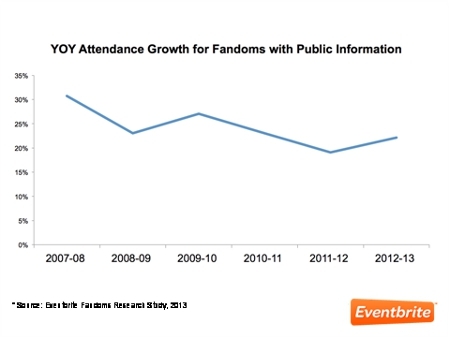 According to Eventbrite’s research, year-over-year attendance at fan events across all sub-segments since 2007-2008 has grown at annual rates ranging from 20% to over 30%, and is currently pacing at about 25%. Considering the record-breaking reports from the first cons of the 2014 season, it will be interesting to see how high the arrow will point when the dust settles this year. 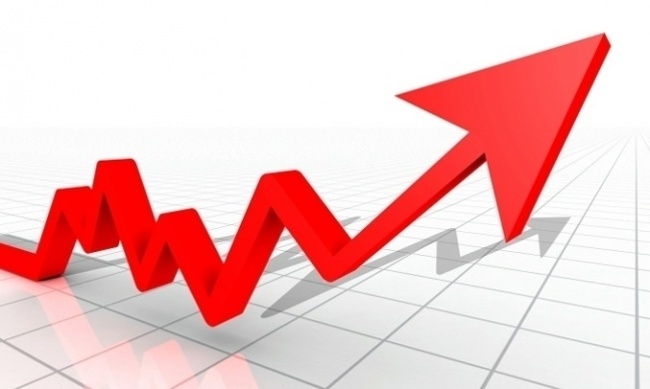 Revenue is growing faster than attendance. The growth in numbers of fans coming to conventions is obvious to anyone who has been to a con in the past few years, and the data bears that out: sustained year-over-year growth of 20% or more since 2007 is pretty impressive. But what’s most interesting is that the dollars generated by cons – at least the ones running on Eventbrite’s platform – are growing at an even higher rate – in some cases, triple digit revenue increases from 2011-2012 and 2012-2013. According to non-public data from fandom events Eventbrite ticketed over the past two years, ticket sales growth of fandom events on the platform significantly outpaced the growth of their festival and consumer events business overall. In fact, fandom events had the highest average gross ticket sales across all festival and consumer event categories, excluding music. Comic cons are king. Another interesting point in the data is the disparity between popularity of certain sub-segments of fandom and the revenue generated by those events. 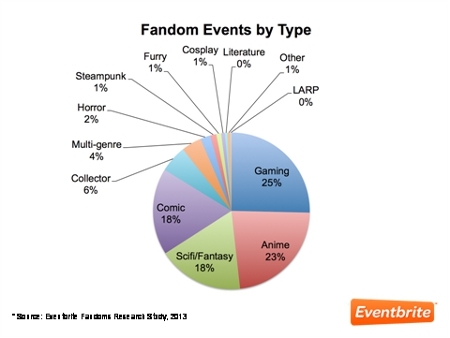 Over half of fandom events on Eventbrite between 2011 and 2013 are categorized as gaming events, but anime and comic events drove 70% of gross ticket sales. Within the fandom segment, comic cons blow away all other categories with average ticket sales over 2.75x the fandom event average. Tip of the iceberg. Eventbrite’s study focused primarily on ticket revenue and growth potential in the market space, but the price of tickets is only a sliver of the dollars being generated by the convention boom. 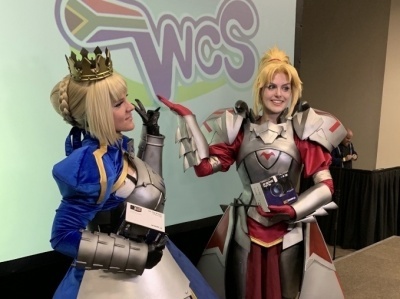 The Los Angeles-based winter show, Comikaze, recently issued a press release claiming that attendees spent an average of $80 per day on the show floor ($4 million total spend; 50,000 attendees). Anecdotal data from exhibitors I’ve spoken with at several large shows suggests that organizers are making money coming and going, increasing table rates even faster than ticket prices. Of course, more of that revenue is now starting to go toward appearance fees that everyone from top celebrities to reasonably well-known artists are starting to demand. There’s also the matter of revenue generated by fandom cons for the surrounding community. A 2010 study found that San Diego Comic-Con brought the host city a cool $163 million just from out-of-town guests staying at hotels. That number has surely gone much higher, and big fandom cons likely make a healthy contribution even to big-time markets like New York and Chicago. It seems within the realm of possibility that the entire fandom event economy – tickets, exhibitor and appearance fees, lodging, and related costs – could be worth nearly three billion dollars in North America alone. Influence is everything. Fandom conventions are only one part of the overall events market, and Eventbrite’s heat map suggests that business is good just about everywhere. What makes fandoms – and particularly comic and gaming shows – different is the influence exerted by attendees. Foodies who are wowed by a particular chef or wine brand at a culinary festival might influence readers of their blog, but that influence isn’t usually felt at scale. 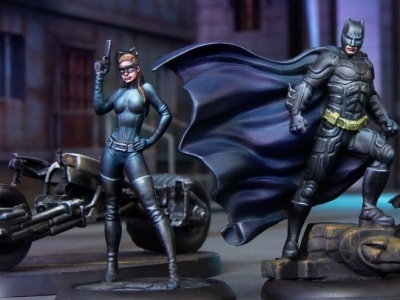 Geek culture fans are opinion-leaders in the multi-billion dollar entertainment and videogame industries, lending invaluable word-of-mouth buzz to key properties. How influential are they? That’s the subject of some upcoming research. Watch this space. Rob Salkowitz (@robsalk) is author of Comic-Con and the Business of Pop Culture and a business consultant in Seattle. He has a business relationship with Eventbrite.